Summary: Maytronics' latest, most advanced and most efficient robotic pool cleaner for in-ground pools. With superior wall-cleaning, a swappable 400 square inch filter and powerful lateral jets, the Quantum can clean even the largest and most demanding pools - for an energy cost of about $0.05 an hour. 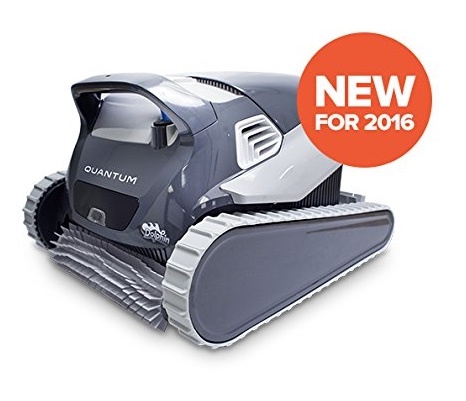 The Dolphin Quantum robotic pool cleaner is the latest innovation from Maytronics. Released in 2016, the Dolphin Quantum is the most advanced Dolphin pool cleaner yet. 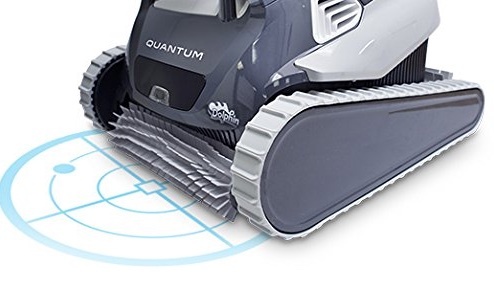 With features such as HyperGrip Continues Tracks, SnapLoc Filtration and Power Jet 3D Mobility, the Dolphin Quantum outpaces most other pool cleaners in the market. 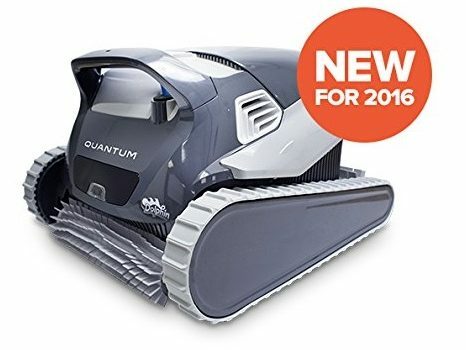 With a host of new and exciting features, the Dolphin Quantum is one of the most advanced robotic pool cleaners you can buy. Compared with the Dolphin Nautilus and Triton, the Dolphin Quantum offers more power, a larger filter cartridge, smarter navigation, more energy savings and an overall improved design. The result is a machine that cleans your in-ground pool completely and efficiently, better than ever. The first thing you will notice about the Dolphin Quantum is its excellent vertical climbing ability, powered by a new technology called PowerJet 3D Mobility. PowerJet 3D uses a set of vortex jets installed at the top and sides of the cleaner that allow it to move laterally with lightweight ease. This allows it to clean the floor and walls more completely. The extra thrust provided by the jets helps it to move with better navigational accuracy, removing every bit of dirt and debris on the floors, walls, corners and tile line. To maintain traction, this robotic cleaner is equipped with continuous rubber tracks that maintain grip even on slippery surfaces. This is especially important when the cleaner is running up vertical surfaces. For cleaning vertical surfaces like walls and stairs, the Dolphin Quantum uses dual scrubbing brushes for deep cleaning. The brushes also spin at twice the speed of most brushes, ensuring that even the most stubborn dirt comes of of your pool walls. An essential feature of any robotic pool cleaner is its filtration system. The Dolphin Quantum has done a great job here with its quick-change micron filters. 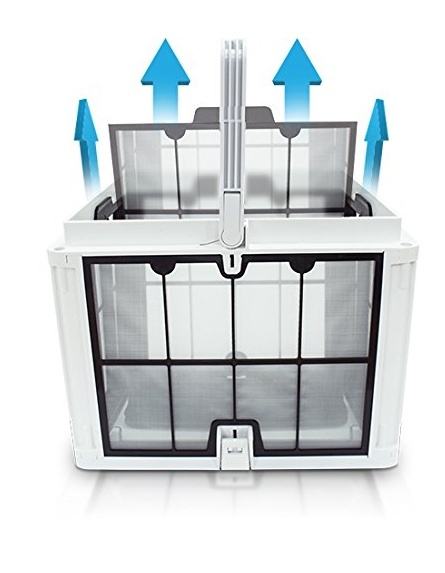 The swap-able cartridge filters lets you to choose the right filter for the job, whether to clean leaves and twigs or to filter-out microscopic algae and sand. It also comes with an extra-large basket for leaves and twigs. The Quantum also minimizes the number of times you’ll have to clean the filters, because the Dolphin Quantum comes with the largest cartridge ever installed in a robotic pool cleaner. Small cartridges tend to fill up quickly and are a mess to remove and clean out. With the Quantum’s 400 square inch cartridge, thing just got a lot easier. The cartridge has a special design that allows its four sides to quickly snap apart for easy cleaning. You can even open the bottom panel to let the debris simply fall out. In addition to these features, the Dolphin Quantum also comes with Maytronic’s latest intelligent navigation algorithm, SmartNav 2.0. This smart robotic scanning system helps the Quantum learn your pools dimensions and calculate the most efficient path for a thorough cleaning. It can even sense & remember ladders and drains, ensuring it will not get stuck at any point. The forward-facing blue light on the Quantum is pretty cool at night, too. This is unlike anything you will find in any other robotic pool cleaner. Powerful vortex jets use water to give the cleaner easy and flexible maneuverability. This, combined with the continuous tracks wheels gives the Dolphin Quantum unrivalled power in covering every inch of the pool, including the walls, floor and tile line. This new invention allows the cartridge to open on all four sides, allowing you to clean out the debris thoroughly and with ease. It can even open at the bottom. Most cartridges tend to be challenging to clean and debris gets stuck inside. With Quantum’s extra large SnapLoc cartridge, you do not have to worry about any of this. The Dolphin Quantum uses the combined effect of two hyper-speed brushes to dislodge the most stubborn of dirt from your pool. Most cleaners rely only on vacuuming to get debris off the floor and walls. With the added effect of fast rotating brushes, the Dolphin Quantum is unmatched in cleaning power. 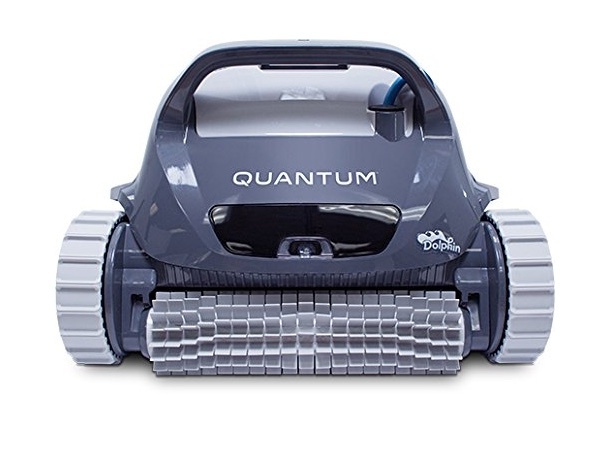 The Quantum robotic cleaner gives you full control over when to clean your pool and for how long. Programming the frequency and duration of cleaning is pretty easy. You can set three cleaning frequencies; every day, twice a week and thrice a week. 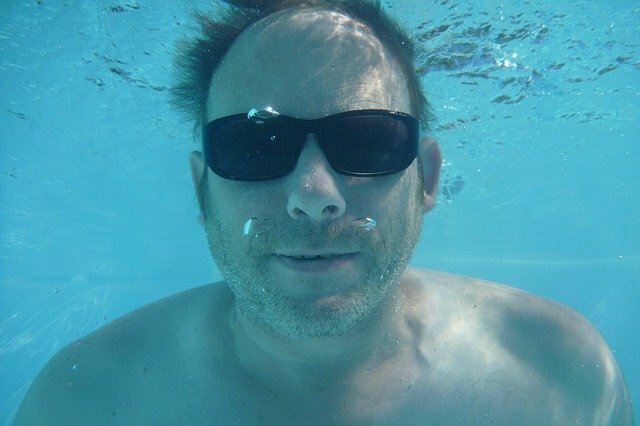 Set the best frequency depending on how frequently your pool is used or how dirty it gets. The standard cleaning cycle is two hours long, but you can adjust it per your unique needs. The Dolphin Quantum is not just about cleaning thoroughly; it is also about maximum energy efficiency. The Dolphin Quantum operates using 90 percent less energy than pump-driven cleaners while maximizing output. The company estimates that you will only spend about 5 cents an hour to clean your pool. Saves energy. The cleaner drastically improves on energy efficiency while not compromising on cleaning capability. Huge, removable cartridges. No other pool cleaner features the capacity and ease of changing that the Quantum’s SnapLoc cartridge does. A bit heavy. At 27.2 pounds, the unit is can be a pain to lift out of the pool. You may need a caddy for easier handling and storage. Not cheap. At a little over $1000, the Dolphin Quantum is a high-end machine that comes with a high price tag. SmartNav 2.0 robotic scanning system. Cleans in-ground pools only with a maximum 60 feet in length. SnapLoc top loading cartridge with access from all sides including the bottom. Standard two hour cleaning cycle with programmable frequency settings. The Dolphin Quantum’s cleaning ability, ease of use and energy efficiency are unrivaled. While it’s certainly not cheap, the Dolphin Quantum is an advanced and efficient pool cleaner that will scrub every square inch of your in-ground pool, including stairs, walls and crevices. Even better, you won’t have to clean the filters as often. what are the pros and cons of the Dolphin Quantum vs. the Dolphin M500/Dolphin Premiere which seems to be about $100 more. Hi, Brian. I prefer the Quantum over the Premiere. I am curious about the frequency and cost of replacing the moving parts, tracks etc. Sometimes the complex the system, the more frequent and costly the repairs. Any more or less than say, a Polaris system? So far, verified owner reviews are positive – not a lot of repairs needed.